Situated northeast of Corfu town in Barbati, in one of the most picturesque villages on the island of Corfu the Pantokrator Hotel is set among the foothills of the impressive Pantokrator Mountain. This specific part of the island is renowned for its breathtaking panoramic views over the southern part of Corfu, the coastline of Albania, the Greek mainland and of course the crystal-clear blue waters of the Ionian Sea. Pantokrator Hotel is built in the typically Mediterranean architectural style where the amphitheatrically setting of room blocks provide a village-style environment and stunning views. The 102 rooms are boutique-style each with its own unique character. The interior decoration makes them each one of a kind while large balconies with their stunning views views over the Ionian Sea, Corfu town, the Greek mainland and the Albanian coastline ensure a tranquil carefree summer holiday. 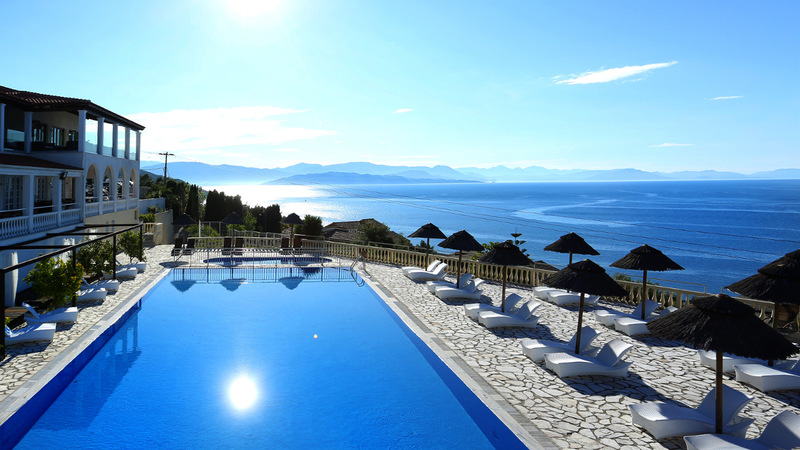 Hanging over the majestic Barbati beach and overlooking the Ionian Sea, the hotels generously sized swimming pool invites you for a refreshing swim. Next to it, there is also a smaller sized children’s pool. Our guests relaxing by the poolside, lying on the sun beds and being under the famous Greek sun may enjoy a drink or a snack from our pool bar. For those who are more energetic, there is a newly- constructed gym right above the swimming-pool area and on top of the pool bar. Our privileged guests can enjoy their fitness session as they combine it with the relaxing panoramic views. The Barbati beach, which has been awarded by the world-renowned eco-label Blue Flag, is only 300 meters away from our premises. There is also a small cove right in front of the hotel. Hotel amenities also include “The Olive Tree Restaurant“, with panoramic views, 24-hour reception service, currency exchange, postal services, fax services, accessible free outdoor parking, baggage hold, hotel-wide air-conditioning and free WiFi. Our friendly, knowledgeable, multi-lingual team is always available and happy to assist you during your stay at Pantokrator Hotel Corfu.